Mexico's Saul Alvarez unified the WBC and WBA light-middleweight titles with a unanimous decision over American southpaw Austin Trout in San Antonio. Alvarez (42-0-1) defended his WBC title while also claiming the WBA and Ring Magazine belts, receiving winning scores of 115-112, 116-111 and 118-109. 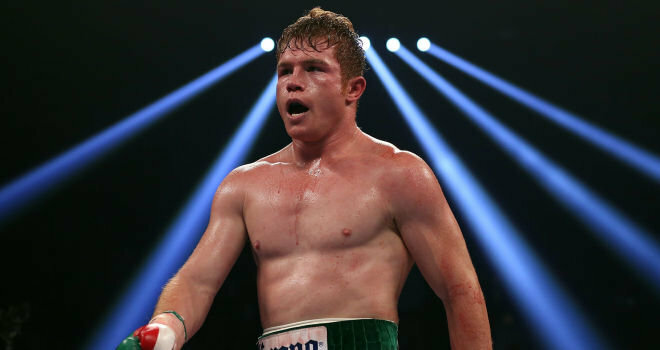 Alvarez's brother, Rigoberto, lost the WBA title to Trout in February 2011 in the family's hometown of Guadalajara, but it was a defeat that provided the inspiration for Saturday's victory, stating: "This is for my brother. It was a big motivation for this fight. "Austin Trout is a very difficult fighter. He's a southpaw. But we were more intelligent in this fight today - and the better the opponent is, the better we will get." Alvarez knocked down Trout (26-1) once and staggered him several times to the delight of the crowd of 39,247 who kept up a constant chant of "Mexico! Mexico!" Trout was the more active fighter, connecting on 154 of 769 punches compared to 124 of 431, but Alvarez landed 43 per cent of his power punches compared to 27 per cent for Trout. The action picked up significantly in the second round with Alvarez delivering a series of body blows and Trout's corner nearly pulling down the ringside cameraman because he was obstructing their view. Alvarez dominated the action, taking the second round, too. Alvarez staggered Trout with a left hook to the body midway through the third round, causing the southpaw to stop and wince. Trout recovered, delivering several body blows. Alvarez stunned Trout with a left hook to the head in the fourth as the fighters continued to trade blows. The Mexican dropped Trout early in the seventh round, catching the southpaw flush to the chin with a powerful straight punch. Trout staggered a few steps backward before falling front first to the canvas. Alvarez continued to deliver right hooks and jabs to the head, staggering Trout twice more in the round. Thanks to the semi-open scoring system, Alvarez's corner could advise their fighter he was ahead through eight rounds. He went into defensive mode from there, but still won easily. Trout made no attempt to defend his loss, stating: "He was better than me. I have no excuses." SAN ANTONIO -- Saul "Canelo" Alvarez eagerly grabbed the WBA championship belt he had just won by unanimously outpointing Austin Trout on Saturday night at the Alamodome. Alvarez (42-0-1) unified the 154-pound titles with a dominant victory, retaining his WBC super welterweight championship along with the vacant Ring Magazine belt. But it was the WBA belt that was the ultimate prize - and it wasn't his. Saul Alvarez (right) battered Austin Trout for 12 rounds in a unanimous decision in San Antonio. Alvarez receiving winning scores of 115-112, 116-111 and 118-109 to beat Trout, from Las Cruces, N.M. Some observers speculated the 21-year-old Alvarez wasn't ready for a veteran opponent like Trout (26-1), but they didn't realize how personal the bout was to him. Trout was the more active fighter, connecting on 154 of 769 punches compared to 124 of 431, but Alvarez landed 43 percent of his power punches compared to 27 percent for Trout. "Austin Trout is difficult fighter, but I was smart," Alvarez said. "Little by little I figured out how to fight him. I was able to connect with my right and my jab. My jab was key."